"They get funny when you mess with their money." 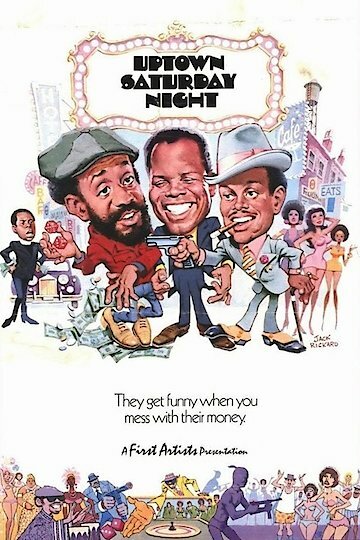 Uptown Saturday Night is a comedy directed by and stars Sidney Poitier. He is hilarious as Steve Jackson, a steel mill worker who is married to Sarah Jackson, played by Rosalind Cash. Steve's friend and sidekick Wardell Franklin, played by Bill Cosby brings non stop laughs, action and adventure. Also, starring Harry Belafonte as Geechie Dan Beauford , Flip Wilson as The Reverend and Richard Pryor as Sharp Eye Washington. The collaboration of this cast, makes for one hour and forty four minutes of tummy tickling funny. Steve and Wardell are bored, when Wardell talks his good friend into going to a party. It's at an after hours nightclub, called Madam Zenobia's. Full of themselves, they enter the club looking to have a good time. They are only there for a little while when the club is robbed at gun point. Steve and Wardell are shook and go home feeling defeated. Steve awakes the next morning and realizes he has the winning lottery ticket; however it is in his stolen wallet. This is when the plot really gets comical. Steve and Wardell have to figure out who robbed the club; then get Steve's wallet back with the winning ticket intact. When the smoke clears, Steve and Wardell decide to use their super sleuthing skills to solve the riddle of who robbed Madam Zenobia's nightclub. Steve and Wardell start by walking the streets, shaking every tree they can. From fake cops to con artist and unethical politicians, they contact everyone including underworld bosses. They meet up with Geechie Dan Beauford, who they believe robbed the nightclub. Convincing the thieves to return the wallet and its contents without raising suspension would be much harder than they thought. This is only one of the weird confrontations they encounter. Add crazy car chases, knee slapping jokes that follow them everywhere and you complete this timeless movie. Uptown Saturday Night is currently available to watch and stream, download, buy on demand at Amazon Prime, Amazon, Vudu, Google Play, FandangoNow, iTunes, YouTube VOD online.